Every Thought There Ever Was, 2018, is a major new touring exhibition by Lindsay Seers. The artwork is funded by Wellcome and co-commissioned by Matt’s Gallery, London; The MAC, Belfast; Focal Point Gallery, Southend-on-Sea; Hospitalfield, Arbroath; and John Hansard Gallery, Southampton. I had the pleasure of contributing to the production management of the project between November 2017 - May 2018. 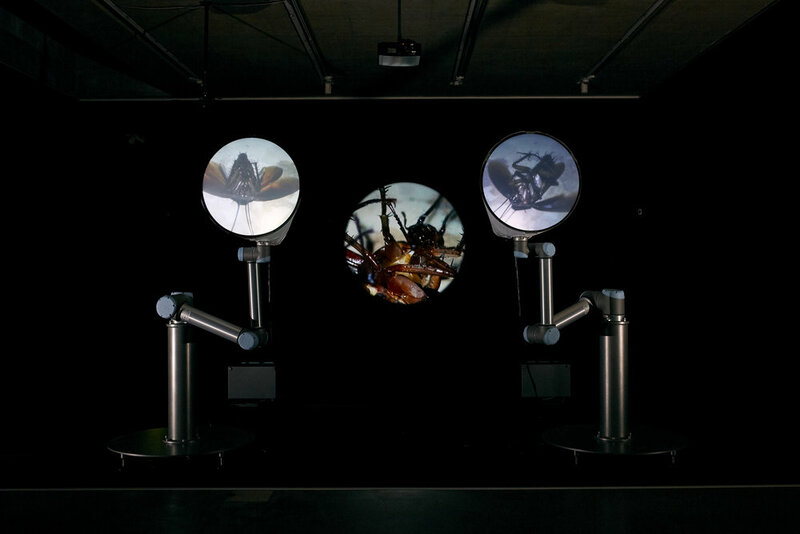 Incorporating industrial robotics in conjunction with a three-screen video projection, the work is shaped by philosophical ideas and scientific research concerned with the phenomenon of consciousness. Through digital animation, special effects, drawing and sound design, Every Thought There Ever Was explores the extraordinary brain functioning that occurs in the condition of schizophrenia. Two screens, supported by robot arms, move with the images, bringing agency to them as an active element in the work. The work draws on an experimental treatment known as Avatar Therapy, in which those living with schizophrenia can speak to their persecutors in a digital world. Guided by first person accounts and a collaborative drawing exchange, Seers’ work has been shaped by conversations with scientific partners including Anil Seth at The Sackler Centre for Consciousness Science and Chris Frith, Emeritus and Professor of Neuropsychology, UCL to explore the current studies and thinking on the condition. Pursuing her on-going fascination with how an individual’s biography embodies history, Seers takes Victorian surgeon James Miranda Barry as her narrator. Barry transcends time through a connection with the offspring she gave life to by performing a groundbreaking emergency Caesarian section operation. Barry’s future life sees her manifest as an Avatar with an ability to cure. The exhibition will premiere at The MAC, Belfast from May 3rd to July 29th 2018. Following this it will open at Focal Point Gallery, Southend-on-Sea, from September 8th to December 23rd 2018, in 2019 at Hospitalfield and in 2020 at John Hansard Gallery.